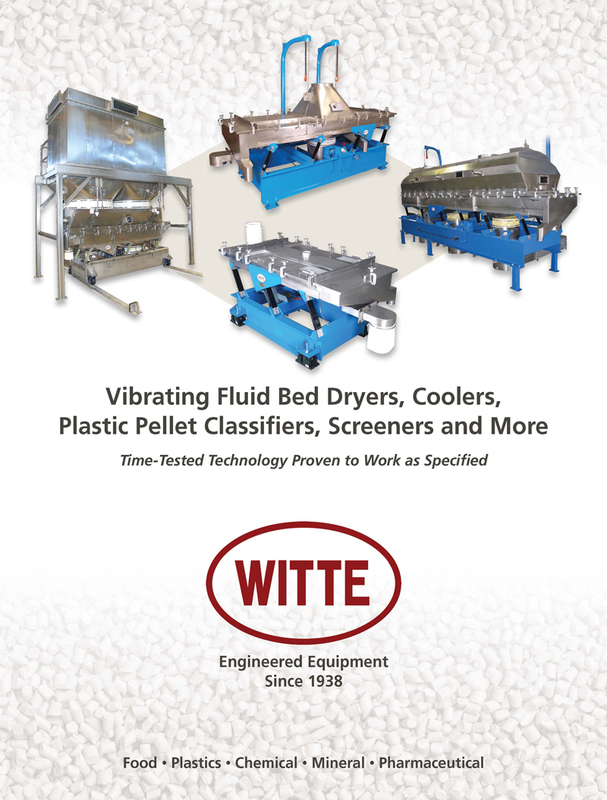 Washington, NJ: New literature from process equipment manufacturer The Witte Co., Washington, New Jersey (www.witte.com) showcases the company’s line of vibrating fluid bed dryers, coolers, pellet classifiers, screeners, conveyors and other vibrating process equipment. Presenting the 4th generation, family-owned company with its long history as a pioneer in the development of fluid bed and vibratory processing technology, the brochure details the machinery, design advances and proprietary technologies that, together, have proven to meet tight product specifications and deliver reliable, 24/7 performance processing a diverse range of materials over nearly 80 years. The literature features the company’s integral baghouse fluid bed dryer concept that allows fine particles to be processed using the fluid bed without any product loss while also recycling a portion of the heated exhaust air for savings in energy. The company’s breakthrough Witte 400 plastic pellet classifier is also featured for its unique ability to offer air classification, cooling, drying and fines and oversize pellet removal in a single, integrated unit. Both the fluid bed dryer and pellet classifier are shown in cutaway illustrations to reveal their inner workings. Developed for process engineers in the food, plastics, chemical, pharmaceutical, mineral and other industries, the literature details how Witte equipment is designed for easy access to support frequent inspections and complete cleaning. The company’s on-site test laboratory, spare parts department, and technical support services are also covered.